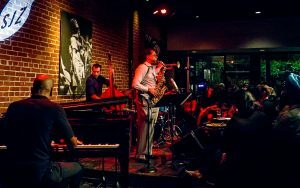 Over a two-set, nearly two-hour show, alto saxophonist Rudresh Mahanthappa and his quintet showed why they may be one of the best live bands on the national jazz scene today. Spurred on by the ever-changing rhythms of chameleon drummer Dan Weiss, the band showed themselves immensely capable of transforming mood and melody at a beat’s notice. Such quick changes showcased how deep these musicians listen to each other, as anything on the bandstand seemed likely to dissolve at any second. As a listener, it made me listen even more closely, savoring the back-beat before it switched to half time or became accented by cymbal flourishes and drum rolls. The interplay between Mahanthappa and trumpeter Adam O’Farrill, son of Afro Latin Jazz Orchestra leader Arturo O’Farrill and grandson of Latin jazz pioneer Chico O’Farrill, beckoned back to the days of Bird and Diz, a conscious decision the bandleader made to evoke that legendary horn front line on his latest effort, the critically-acclaimed Bird Calls. Rudresh Mahanthappa performs at the SJZ Fall Concert Series at Cafe Stritch. Photo by Walter Wagner. The unsung hero of the night was bassist Thomson Kneeland, holding down the band’s pulse as others tested the group’s outer limits with their striking solos. Yet when given the moment to shine, his phrasing proved quite lyrical, his hands arriving on emotionally resonant melodic hooks in four beat measures repeated a handful of times before arriving at a similarly lyrical space elsewhere. He may not have had a lot of time in the spotlight, but he certainly made an impact when given the chance. Joshua White added a dash of angularity and dissonance to the mix, complementing the ferocious virtuosity on stage with a fearless approach to the keys. 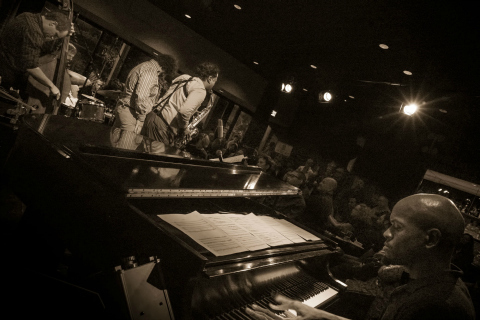 On certain solos, his fingers seemed to transition from massaging notes to mashing together chords, wringing out sound from every piece of the instrument’s musical range. His mad-scientist-like focus on utilizing every inch of his musical tool revealed that he and drummer Weiss were the rebel duo working to push this unit further out when needed. O’Farrill proved a worthwhile complement to Mahanthappa in moments when the two played overlapping melodies. Toward the end of the show, they playfully traded four-bar solos, simultaneously mimicking and challenging one another. Those moments of woven musical unity showed off Mahanthappa’s skill as a composer, presenting spaces for the two brass players to find their individual space without crowding the mix. 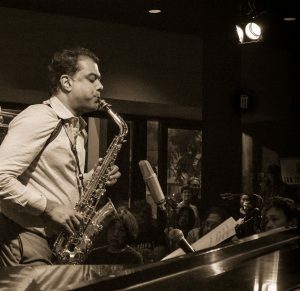 Rudresh Mahanthappa Quintet. Photo by Marilyn Wagner. Lastly, Mahanthappa clearly showed why he’s been voted one of the best alto saxophonists in the world by leading jazz publications. With a melodic, virtuoso delivery, his solos proved easy to listen to without seeming to sacrifice the intensity set forth by his band mates. His speedy runs proved effortless while his slower, more sentimental moments didn’t seem to divert from the heart of the compositions. Cafe Stritch’s crowded room seemed to take in each number joyously, clapping for each solo whenever able. While Mahanthappa’s brand of jazz may not be the easiest to digest immediately, watching it take place in person added a new layer of appreciation for a man who, after twenty years in the industry, seems to finally be making waves as one of jazz’s major contemporary players. If his show set the tone for what to expect over SJZ’s next two shows for the Fall Concert series, fans should expect nothing but top-caliber talent. 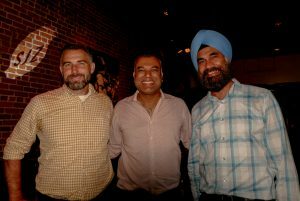 (From left) SJZ Executive Director Brendan Rawson, Rudresh Mahanthappa, and SJZ Board Member Jaspal Kohli. Photo by Walter Wagner. Rez Abbasi & Junction perform Fri, Oct. 28 at Cafe Pink House in Saratoga. Get tickets. Mariachi Flor de Toloache perform Sun, Oct. 30 on the SJZ Boom Box mobile stage at Mexican Heritage Plaza as part of La Ultima Parada. FREE admission to concert. Featured image (at top) by Walter Wagner.